Get the Latest News for Renal Care Professional! 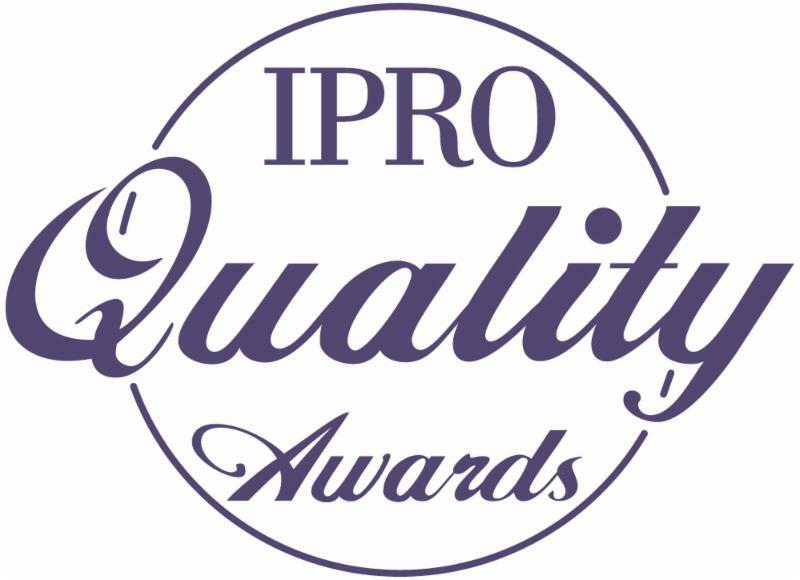 Each year, IPRO ESRD Network of New England recognizes outstanding performance by healthcare providers and stakeholders throughout New England with our Quality Awards Program. The goal of the Quality Awards Program is to recognize members of the end stage renal disease (ESRD) community who have consistently set themselves apart from others by delivering exceptional care and/or contributions to Network activities in the New England area throughout the year. The ESRD award categories - Excellence, Engagement, and Continuous Improvement - align with the mission of IPRO ESRD Network of New England to promote healthcare for all ESRD patients that is safe, effective, efficient, patient-centered, timely, and equitable. The 2018 Quality Awards will be presented at the 6th Annual ESRD New England Fall Meeting on Tuesday, October 30, 2018 at Mohegan Sun Conference Center. Nominations are being accepted until Friday, June 29, 2018 . NHSN’s stated purposes have been recently updated with new provisions for sharing data with local and territorial health departments and with the Centers for Medicare & Medicaid Services (CMS). As a result all newly enrolled facilities must accept the Agreement to Participate and Consent upon enrollment, and all currently participating facilities must accept or “re-consent” to the Agreement. Currently enrolled facilities are required to accept the new Agreement to Participate and Consent electronically by June 15, 2018. If a facility fails to re-consent by the deadline, its NHSN functionality will be suspended until the consent form is accepted. Newly enrolled facilities must consent within 60 days of enrolling in NHSN. After submitting enrollment forms, the person(s) listed as the Dialysis Component Primary Contact and the Healthcare Personnel Primary Contact must log in to the enrolled facility in NHSN. On the Dialysis component homepage, the primary contact should review the electronic consent form and then check the ‘Accept’ box and click ‘Submit’. For more information contact NHSN@cdc.gov with “consent form” in the subject line or visit https://www.cdc.gov/nhsn/about-nhsn/faq-agreement-to-participate.html. Is the information about the NHSN deadline extension useful to you? 1. Non-directed donation. With this type of donation the donor does not name the specific person to get the transplant. The match is arranged based on medical compatibility with a patient in need. Some non-directed donors choose never to meet their recipients. In other cases, the donor and recipient may meet at some time, if they both agree, and if the transplant center policy permits it. 2. Paired kidney exchanges. This type of donation is becoming very common and an exciting option for kidney recipient and donor pairs who are not compatible with each other. Previously, people with kidney failure who had an incompatible donor were not able to benefit from the transplant being offered to them. However, paired kidney exchange programs are having a significant impact on the expanding options of living kidney transplants. Paired exchanges are now allowing transplants to occur between incompatible donor pairs and in a few unique ways. 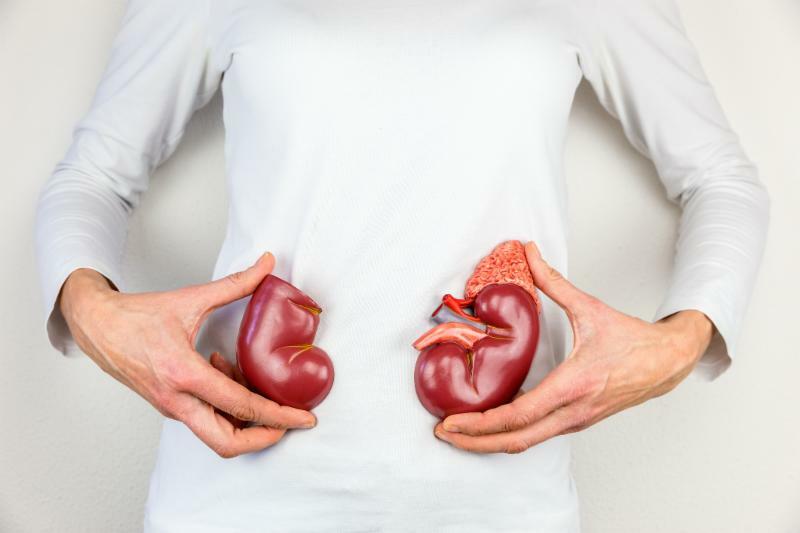 There are many types of living kidney donations. The Network encourages dialysis facility staff to educate patients and care givers about transplant options and provide resources to help them make informed decisions. Is the information about living non-related transplant and kidney exchange useful to you? CMS implemented the ESRD QIP in 2012 to promote patient health by providing a financial incentive (pay for performance) for renal dialysis facilities to deliver high quality patient care. Measurements for the 2018 calendar year, which will be reflected in the 2020 payment year, are separated into three components: clinical, safety and reporting. Dialysis facilities are required to report quality measurements to CMS. These quality measurements are made available to the public. Is the information about the Quality Incentive Program (QIP) useful to you? Reducing facility vascular access rates has been a priority for CMS for many years. With proper and ongoing staff and patient education, patients are able to maintain healthy AV fistulas or grafts. Regular performance of the look, listen, feel check allows early detection of problems and implementation of appropriate interventions to protect the access . The Look, Listen and Feel technique is a quick and effective way to assess a patient’s access prior to cannulation. This method can be taught to patients so that they can assess their own access on non-dialysis days. This is a simple method of monitoring that does not require any special equipment and can potential save a patient’s access. Photo source: ESRD National Coordinating Center . Is the information about reducing catheter rates useful to you? Health care workers have an increased risk of workplace violence compared with workers in private industry, with nurses as the most common victims, and patients as the most common perpetrators, according to an article " Aggression Management Education for Acute Care Nurses: What's the Evidence?” Risk factors include influences such as ongoing aggressive behaviors, psychiatric disorders, substance abuse, stress/frustration/anxiety, a sense of powerlessness, perceptions that violence is tolerated, inadequate security, long wait times, and lack of awareness. The article offers great tips on how education about aggression management was successful in building confidence in areas such as situational awareness, de-escalation practices and early intervention. Click here to learn more about de-escalation techniques as presented by Margo Halm, RN, PhD, NEA-BC in the article " Aggression Management Education for Acute Care Nurses: What's the Evidence? " and contact your Network whenever you need further guidance on managing a difficult patient situation. Is the information about de-escalation useful to you? Ensuring patient involvement in every aspect of healthcare is paramount to positive health outcomes and is a best practice for improvement processes. According to the article, “ Patient involvement in quality management: rationale and current status", through involvement in their care, patients served as catalysts for broad change in the attitudes of staff by providing a motivation for wider organizational changes. These patients were able to adopt different roles across projects where they shared their experiences, helped to identify improvement priorities and developed potential solutions with the staff that had cared for them. Click here to read more on best practices for involving patients in quality improvement. Is the information about patient involvement in quality improvement useful to you? Click here for up-to-date KCER Alerts and Recalls. For professional and patient KCER resources, please click here. Is the information about KCER Alerts and Recalls useful to you? 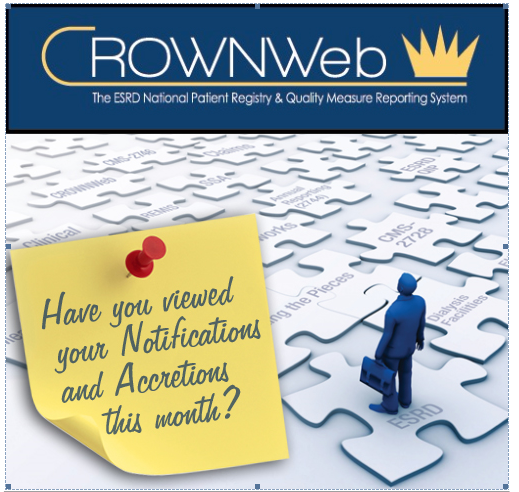 Notification—a discrepancy in patient data between what CMS and the Social Security Administration (CMS/SSA) database has on record and what exists in CROWNWeb. All facilities (including batch submitting organizations) are responsible for correcting and maintaining their own data. New notifications and accretions should be resolved within 15 days and those that are under investigation are to be resolved within 30 days. The Network is responsible for the oversight of notifications and accretions and will keep facilities informed as these issues arise for correction. For a complete tutorial, please click here . Is the information about updating Notifications and Accretions useful to you? A facility can request an exception or extension (if applicable) to various quality reporting requirements due to extraordinary circumstances beyond the control of the facility. Such circumstances may include (but are not limited to) natural disasters (such as a severe hurricane or flood), systemic problems with CMS data collection systems that directly affected the ability of facilities to submit data, or extreme circumstances preventing facilities from electronic clinical quality measure (eCQM) or electronic health record (EHR)-based reporting (e.g., extraordinary infrastructure challenges or vendor issues outside of the facility’s control). This also includes temporary closure of the facility. To request an exception or extension, facility administration must complete and submit the “ECE request form”, found here , to the ESRD QIP mailbox at ESRDQIP@cms.hhs.gov . In order for a facility to prevent loss of points under QIP this form must be submitted within 90 calendar days of the extraordinary circumstance following the end of the last reporting period. Is the information about Extraordinary Circumstances Exception useful to you? IPRO End-Stage Renal Disease Network of New England, the ESRD Organization for Connecticut, Maine, Massachusetts, New Hampshire, Rhode Island, and Vermont, prepared this material under contract with the Centers for Medicare & Medicaid Services (CMS), an agency of the U.S. Department of Health and Human Services. The contents presented do not necessarily reflect CMS policy. CMS Contract Number: HHSM-500-2016-00019C.